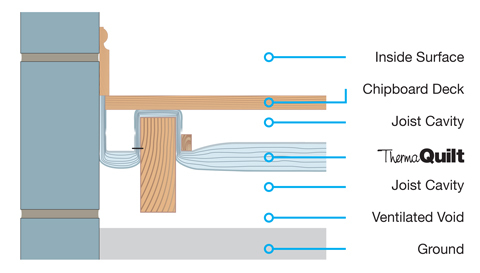 ThermaQuilt is rolled out over the joists, then stapled in place to create required airspace or nailed in place through the YBS saddle clips to maintain the required 50mm airspace (4 saddle clips per m²). The horizontal joints are tightly overlapped and left open to allow any moisture accumulation to dissipate. ThermaQuilt should be sealed around the perimeter or brought up above the floor deck. The decking is then fixed at 200mm centres with screws 37mm into the joists.